Kalsio®+ is a natural calcium supplement. Calcium may assist in the normal growth and maintenance of bones, teeth, nervous system and muscle function. We recommend moving from conventional calcium supplements and introduce a balanced calcium product in a natural form (active food source). From the makers of Mobicosa®, Kalsio®+ is the most advanced calcium supplement, in the form of protein, available in the marketplace. To read research on Kalsio®+ click here. No additives and DOES NOT contain Yeast, Starch, Gluten, and Fillers Wheat, artificial colour or additives. Now with added vitamin D for greater absorption. The first 100% Microcrystalline Hydroxyapatite Marine supplement produced from selected fish species offered to Australia. A complete protein based calcium supplement. The only type of Calcium supplement to have supportive characters such as calcium binding peptides. (FBP) Fishbone Peptides are known for their attraction to calcium salts. The only type of calcium supplement presenting CO-factors proteins – FBP, collagen, phosphorous, magnesium, glycosaminogylcans and amino acids. The only calcium supplements in organic and inorganic form – excellent supportive properties – a synergistic approach to support bone health. The only calcium that is a natural 2:1 ratio with phosphorous. Has collagen and Fishbone Peptides in the form of proteins, which have shown excellent transportation properties. The bio-available results demonstrated the highest calcium transportation results over a 4 hour period. The solubilised calcium results confirmed all transported through the gut wall lining. The only type of calcium supplementation existing in natural form. No additives. 100% selected fine fish bone. Calcium is one of the main minerals required by our body. There is calcium present in every one of our body’s cells. The key role of calcium is to provide nourishment for the musculoskeletal system, bone strength and development. As bones age they deplete of calcium, making them weak and brittle. Our diets often lake the nutrients and minerals required for bone strength and development. Consumption of coffee, tea, carbonated drinks, alcohol and smoking are just some of the contributing factors that can reduce calcium in our body/bones. Women particularly suffer from calcium deficiency, often resulting in osteoporosis. Our bodies require sufficient amounts of calcium in order to combat calcium deficiency. You must have a calcium supplement that is easily digested and retained by the body to support the skeletal system. Supplying the correct bioavailable nutrients to the skeletal framework is the main key for development, movement, posture and well being. Kalsio®+ is made from selected species of organic native fish bone sourced only from the clean ocean waters of New Zealand. The fish species used are caught under the environmentally sustainable quota management system enforced by the New Zealand Government Dept of Fisheries. This fish bone is derived from small fine fish, and offers high amounts of Calcium in its natural form. Research has confirmed this fine bone is an excellent nutritional source. The benefits of Calcium will contribute to a persons overall health. Kalsio®+ is the only Calcium supplement containing both organic and inorganic constituents. Consisting of Calcium Phosphorus and trace minerals such as Magnesium, Zinc, Potassium, Silica, Rubidium, Manganese, Proteins as Collagen, Glycosaminoglycans and Amino Acids. Calcium: Calcium is an important component of a healthy diet and a mineral necessary for life. Calcium plays an important role in building stronger, more dense bones early in life and keeping bones strong and healthy later in life. Calcium also has a role in the normal growth and maintenance of bones, teeth, nervous system, muscle function, blood clotting mechanism and cardiac function. Phosphorus: Phosphorus is an essential mineral that is required by every cell in the body for normal function. Phosphorus is a major structural component of bone in the form of a calcium phosphate salt called hydroxyapatite. Phosphorus also helps to maintain normal acid-base balance (pH) by acting as one of the body’s most important buffers. Magnesium: Magnesium is vital for healthy bone structure. Calcium interacts with magnesium in many body processes, such as the regulation of blood vessel tone and contraction of muscles, including heart muscle. Calcium stimulates muscles and contracts blood vessels, while magnesium relaxes muscles and dilates blood vessels. 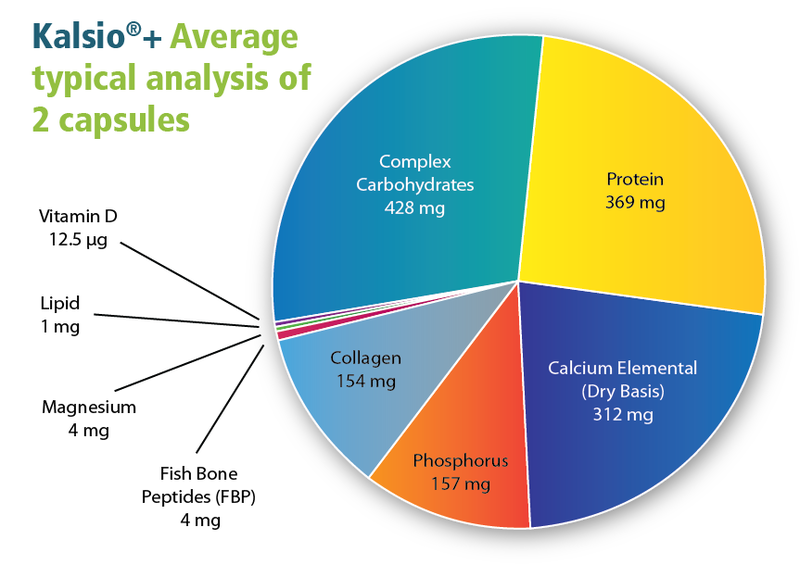 FBP (Fish Bone Peptides): FBPs are known for the attraction of Calcium, thus providing superior transportation qualities – Trial research has demonstrated higher transportation of Calcium. Vitamin D: Aids in the absorption of Calcium helping to form and maintain strong bones. Many years of research has shown that the absorption of a supplement such as Kalsio®+ Calcium has a superior quality due to its combination of intact crystalline structure, vibrant blend of Peptides, Mucopolysacchirides, and the growth factors that accompany the calcium in the true MCHC (Microcrystalline Hydroxyapatite Compound). In-vitro studies confirm that FBP (Fish bone Peptides) such Kalsio®+ can inhibit the formation of insoluble Ca (calcium) salts in a neutral pH. Invivo studies of FBP on Ca (Calcium) bioavailability were examined over the experimental periods, and concluded that Calcium retention was increased and loss of bone mineral was decreased by FBP supplement. Kalsio®+ shows greater bio-availability and therefore a greater amount of calcium is absorbed into the body. Kalsio®+ is manufactured and processed to the highest international standards. Kalsio®+ is specifically processed to retain the essential nutrients, and is manufactured to GMP, EU, HCUPP, NZMAF, Australian & New Zealand Food Safety Standards. 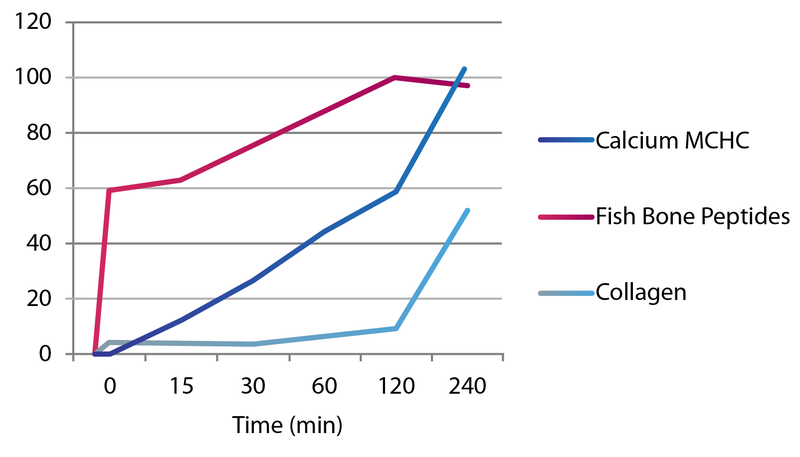 Graph shows the transportation of the Calcium, FBP and Collagen in Kalsio®+ through the intestinal wall lining. This study was conducted to determine the rate of transportation (absorption) of the components of Kalsio®+ across the intestinal wall. Independent study undertaken by Trinity Bio-actives, University of Otago, New Zealand. Measuring transportation data.